This Lemon Dill Coleslaw is a great side dish to any picnic, cookout, or weeknight meal. This crunchy, creamy salad incorporates the vibrant and fresh flavors of spring. The weather has been a fickle pickle this year. One day it’s warm, and the next it’s biting cold and the hurricane-like winds are cracking sturdy trees in half. Last week, I refrained from entering the woods for fear I’d be crushed by a falling tree branch. I’m very impatiently waiting for the warm weather to move in and stay for good. I even went so far as to prepare my deck for outdoor entertaining. So far, I’ve had the pleasure of enjoying a bit of outdoor lounging twice. If you’re anything like me, then you’re desperately craving fresh summer produce. We’re not quite there yet, but I did make you a side dish inspired by the bright flavors of spring that will transition easily into grilling season. This Lemon Dill Coleslaw comes together in 10 minutes with a few simple ingredients. The triple dose of lemon and fresh chopped dill really brightens the dish, adding a fresh burst of flavor. I used lemon in three different forms: lemon juice, lemon zest, and a splash of Nielsen-Massey Pure Lemon Extract. I know what you’re thinking, but, I promise, it’s so good. The lemon extract takes the lemon flavor up a notch, really enhancing the lemon flavor. The first time I ever used their extract in a savory dish was in my recipe for Cranberry-Orange Rice Pilaf, and I’ve been waiting for my chance to do it again. 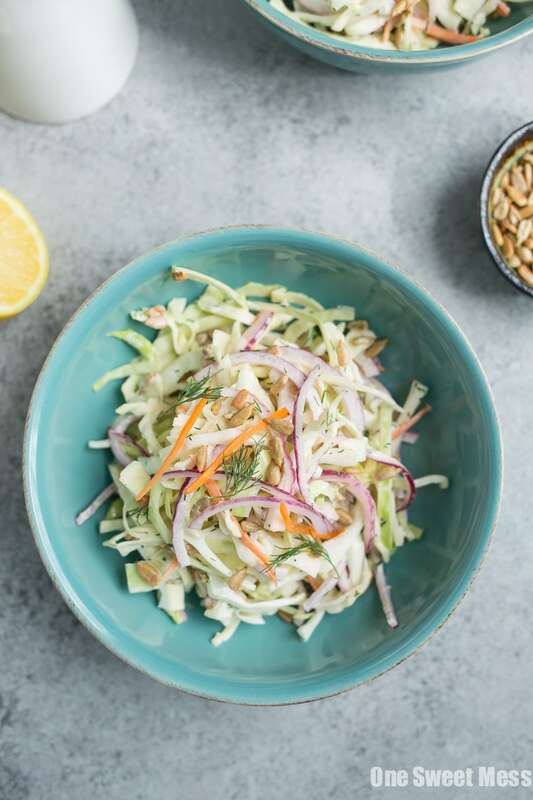 Next time you’re whipping up a meal on the grill, pair it with this fresh and crunchy Lemon Dill Coleslaw. In a large bowl, combine cabbage, carrots, red onion, and dill. Set aside. In a small bowl, whisk together mayonnaise, lemon zest, lemon juice, sugar, lemon extract, and generous pinch of salt and pepper. Pour the mixture over the cabbage and toss to combine. Chill for at least an hour or overnight. Fold in the sunflower seeds right before you’re ready to serve. Disclosure: This recipe was developed for the lovely folks at Nielsen-Massey. All opinions are 100% my own. Coleslaw is my go- to side dish for so many meals. I love everything about this flavor combo! Making it soon! The dill in this coleslaw – such a good idea! This sounds so refreshing and such a good switch up from traditional coleslaw. Can’t wait to try it!